A decision announced recently to implement regulations on enforcement of China’s jurisdiction over vessels using waters in the South China Sea raises concern over a confrontation that might start with Filipino, Vietnamese, or other fishing boats accustomed to using these waters and involve powers with a strong interest in stability and navigation, notably the United States. The decision was condemned as “provocative and potentially dangerous” by the State Department spokesperson and came on the heels of China’s abrupt announcement of an Air Defense Information Zone (ADIZ) over the disputed East China Sea, with the ambassador in Manila saying a zone could come over the South China Sea. The United States and its allies strongly condemned the Chinese move, and Secretary of State John Kerry in Manila warned Beijing against declaring a zone in the South China Sea.1 Barack Obama’s “rebalance” seeks to expand US influence, calm tensions and engage as well as compete with China. He has agreed with Xi Jinping to pursue a “new type of great power relations.” Repeated Chinese assertiveness over territorial disputes tests US leadership in the region. Obama’s failure to meet regional leaders in Southeast Asia in October 2013 intensified the debate on the US role in the changing dynamics in Southeast Asia and the broader Asia-Pacific region. Some see a power shift underway with a rising China overtaking a declining America. Others view Obama’s “rebalance” policies as misguided competition with China and unsustainable. Still others, including this writer, are more optimistic about power determinants and see Obama’s approach fitting much better with regional dynamics than China’s conflicted approaches.2 Laying the groundwork for an ongoing discussion, I reflect below on the nature of Sino-US competition in Southeast Asia and on the prospects for continued US leadership. In accordance with the format of this part of the journal, I offer my opinions on how this competition is likely to unfold, emphasizing recent developments in the region that provide evidence on what has been happening. In 2011, Obama and his department directors announced policy initiatives under the rubric of an American “pivot” to the broad Asia-Pacific region, including all of Southeast Asia. The initiatives covered security, economics, and political-diplomatic efforts. They were generally welcomed in the region, though China objected strongly. Facing strong criticism from Beijing and advice from Southeast Asian and other regional friends and allies to avoid confrontation with China, the Americans redefined the pivot beginning in the latter part of 2012 with less dramatic language as American “rebalancing.” Earlier emphasis on controversial US security measures was played down in favor of emphasis on less sensitive economic and diplomatic initiatives. 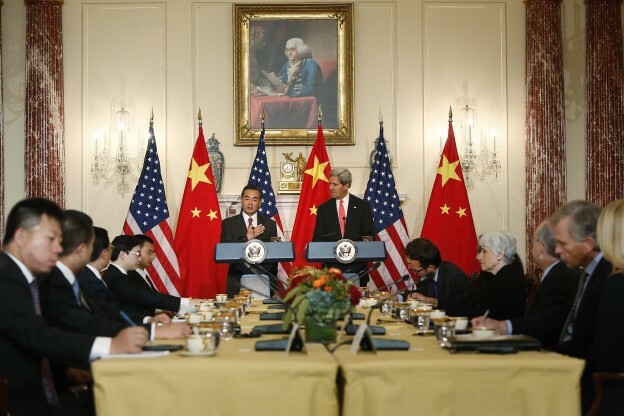 And the US leadership strengthened dialogue with China, resulting in the US-China summit in California in June 2013. It well understood that while allies and friends in Southeast Asia and elsewhere in Asia favored strong US regional engagement as a hedge against possibly domineering behavior by a rising China, almost all governments opposed serious confrontation. Such tension would upset regional stability and undermine development, which together serve as the basis of political legitimacy of the Southeast Asian governments.3 The pattern became established of Chinese assertiveness, US responsiveness, and Southeast Asian management of the resulting tensions in an effort to keep them from rising and to shape the outcomes. Greater Chinese assertiveness vis-a-vis the United States and especially towards US allies, Japan and the Philippines, over China’s broad and disputed territorial claims along its rim in the East China Sea and the South China Sea was the driving force to which others reacted. Since the early years of the post-Cold War period, Beijing’s emphasis has been on peace, development, and cooperation, but in recent years there also has been repeated use of coercion and intimidation in support of broad maritime claims in the South China Sea and the East China Sea. Neighbors and other concerned powers that accept Chinese claims are promised a beneficial relationship of “win-win” cooperation. Those that do not, the two most prominent examples being the Philippines and Japan, are subjected to threats and heavy coercion, short of direct use of military force. The US government endeavors to calm the situation, while it engages in broad-ranging improvement of military, economic, and political relationships throughout the Asia-Pacific region. In Northeast Asia, the situation is complicated by efforts to deal with the North Korean threat as well as multilateral great power competition, but in Southeast Asia, the US approach entails greater competition with China for regional influence on the one hand and greater constructive engagement with Chinese leaders on the other. The pivot was prompted in part by encouragement from regional leaders concerned with Chinese assertiveness amid a perception of declining US interest and disengagement. The shift to a more moderate approach of rebalancing was influenced by their concerns too. Yet, as China’s actions continued, they complicated US calculations, because not only of the desire to sustain engagement, especially during a transitional time when a new leader was being chosen and consolidating his hold on power, but also of divergent responses in Southeast Asia. The United States has seemed uncertain of how to deal with assertiveness by China over territorial claims since 2012. China’s success in advancing its control of disputed areas in the South China Sea, which many view through the lens of its repeated assertive challenges to Japan’s control over islands in the East China Sea, suggest that the policy will continue and, perhaps, intensify. Few governments seem prepared to resist. China’s foreign policy shift in Southeast Asia is the most important in a decade.4 China has long maintained that its foreign policy is consistent, but experience shows repeated shifts with serious consequences, particularly for its neighbors. Mao Zedong was notorious for changing foreign policy; Deng Xiaoping shifted repeatedly in seeking advantage in the US-Soviet-Chinese triangular dynamic. Post-Cold War Chinese leaders focused on advancing conventional relations in neighboring Asia. However, a significant change happened when negative reactions to shows of force over Taiwan and the South China Sea in 1995 prompted China to emphasize reassurance of neighbors in the form of a New Security Concept, even as the United States and its allies were still targeted and sharply criticized by China. Beijing eventually felt compelled to shift again at the turn of the century to an approach of peaceful rise, later called peaceful development, which endeavored to reassure America and its allies as well as its Asian neighbors. The slogans of peace, development, and cooperation continue, but they are accompanied now by repeated use of coercion and intimidation well beyond internationally accepted norms along with other means in support of China’s broad maritime claims. Concerned governments have come to recognize that China’s “win-win” formula emphasizing cooperation is premised on the foreign government eschewing actions acutely sensitive to China over Taiwan, Tibet, and Xinjiang, and that the scope of acute sensitivity has now been broadened to include the maritime disputes along China’s rim. Neighbors and other concerned powers that do not accept Chinese claims are subjected to threats and even heavy coercion. US interventions against bullying were often attacked strongly. To the satisfaction of Chinese commentators, they have become less frequent over the past year. This has raised uncertainty about the seriousness of US commitments, the degree to which Southeast Asian states will seek a greater US role, and the extent to which China will intensify its assertiveness with or without strong pushback. When Obama canceled planned meetings in Southeast Asia in October and the attention of US leaders was diverted to crises in Syria, Egypt, and elsewhere in the Middle East, many commentators in Southeast Asia as elsewhere saw fresh evidence of American decline and inability to implement the president’s ambitious rebalancing strategy. Obama endeavored with mixed results to reassure regional leaders, who grew less confident about the American political, security, and economic engagement with the region. Meanwhile, Chinese leaders seized the initiative to improve Southeast Asian relations, at least for a couple of months. During the leadership meetings in Southeast Asia that Obama missed, they exuded confidence in seeking new economic, diplomatic, social, and security ties that were of strong benefit to most Southeast Asian governments.5 They called for upgrading the China-ASEAN FTA, signing a new good neighbor and friendship treaty with ASEAN, greatly increasing already impressive levels of trade and investment with Southeast Asian nations, expanding road, rail, maritime, air, telecommunications, and energy links, and increasing substantially the flow of Chinese tourists to the region and student and specialist exchanges. China muted emphasis on the divisive disputes involving the South China Sea, reacting in more measured fashion than in 2012 and earlier to the raising of South China Sea issues by others during the 2013 ASEAN and EAS meetings. Xi Jinping moderated reservations over the US-backed TPP when he told the APEC summit in Indonesia that China is open to all trade arrangements so long as they are inclusive. While there was no sign that China was prepared to compromise on South China Sea disputes, the positive Chinese initiatives were broadly welcomed by most Southeast Asian leaders and ASEAN amid reported regional doubts about US interest in the region after Obama’s cancellation. The fact that Chinese positive initiatives to Southeast Asia were not being followed in dealings with Japan raised doubts among some. These were reinforced by continued strong pressure on the Philippines to halt an arbitration case it had initiated before a UN tribunal challenging China’s South China Sea claims. More notably, China in late November abruptly announced ADIZ over the East China Sea, where disputed islands are located, confronting Japan and the United States, who reacted strongly along with US allies South Korea and Australia, while other regional commentary worried about implications for stability throughout the maritime periphery. Southeast Asian commentary voiced concern that Beijing would follow its East China Sea action with an ADIZ over the South China Sea along with concern over Chinese “gunboat diplomacy” as China coincidentally, it seems, deployed its aircraft carrier and battle group for exercises in the South China Sea. How much the ham-handed and conflicted Chinese initiatives hurt or helped the United States in competition with China remains to be seen. At one level, American officials, apart from complaining, appeared to have no clear answer to quell Chinese assertiveness. This seeming inability to counter Chinese advances in disputed areas reinforced images of a power shift from US leadership to Chinese dominance in Southeast Asia and the broader Asian-Pacific region.6 On another and arguably more important level, however, such concerns appear at odds with power realities. By these metrics, the United States remains far ahead of China in influencing Southeast Asia and the broader region. The rebalancing fits much better with the priorities of regional governments than does China’s mix of win-win development and truculence over sovereignty issues and security. The growth of trade with the neighboring states makes China the leading trading partner, or one of the leading partners, of Southeast Asian countries. Producers of energy and raw materials find China to be a ready market. Manufacturers of consumer products and industrial goods often find it difficult to compete with Chinese manufactured goods of low cost and good quality. They have tended to integrate their enterprises with China by joining the influx of foreign investors that each year makes the country the second largest recipient of FDI in the world.7 Led by foreign-invested enterprises, consumer and industrial goods often are produced in China with components imported from foreign enterprises in other parts of East Asia. China often is the final point of assembly, and the value added in China is relatively small in relation to the total value of the product. The final product is frequently exported to advanced Asian economies, or more commonly to China’s largest export markets, the United States and the European Union. Overall, the result is that China’s importance as a recipient of Asian investment, a leading trading partner, and an engine of economic growth has risen dramatically in Southeast Asia. China’s trade, aid, investment, and military support reportedly involve “no strings attached.” This approach was well received by governments in Myanmar (Burma), Cambodia, and elsewhere. Language, culture, and personal exchanges include support for Confucius Institutes, and China facilitates ever larger numbers of tourist groups to Southeast Asian countries. China’s impressive military build-up makes it obvious to all concerned that China is building the strongest military forces in Asia and developing a growing capability to impede and deny access to strategic areas along China’s periphery (notably Taiwan) to US military forces, should they attempt to intervene. This is a source of influence, but it also contributes to a backlash, as countries are uncertain about China’s military aims. Legacies of past Chinese aggression and disruptive behavior represent serious limitations in relations with contemporary Southeast Asia. Remedying these shortcomings seems impossible as most Chinese, even elites, remain unaware of past Chinese behavior. The government, supported by a massive propaganda apparatus, is successful in promoting an image of consistent, principled, and righteous Chinese behavior in foreign affairs to its own people. Conditioned by this thinking, Chinese élites and the general public have poor appreciation of regional and US concerns about the rise of China, while they remain heavily influenced by the Chinese media’s emphasis on China’s historic victimization at the hands of outside powers, notably the United States, Japan, and others in the region associated with them. As a result, they are inclined to react very negatively to outside complaints and perceived infringements of Chinese interests and rights. Territorial disputes with Southeast Asian countries over the South China Sea have become more prominent, impeding Chinese efforts to improve relations with these countries. China’s military modernization and secretive and authoritarian political system have raised suspicions and wariness on the part of a number of its neighbors. The Philippines, Singapore, Vietnam, and Malaysia are countries building their own military power and working co-operatively with one another and the United States in the face of China’s military advances. This month, Hainan province has declared new enforcement measures against foreign fishing boats in a large part of the South China Sea. As many also expect China to declare an ADIZ covering much of this sea, along lines similar to those of its new ADIZ over the East China Sea, tensions are currently mounting. In the coming months, Sino-US relations are likely to be tested, as countries in the region seek a more active US role even as some other countries in ASEAN prove to be hesitant. China’s past record of aggression and intimidation towards most Southeast Asian countries meant that it had few positive connections on which to build cordial relations. The “Overseas Chinese” communities in Southeast Asian countries represented political forces supportive of their home country’s good relations with China. However, dominant ethnic, cultural, and religious groups often had a long history of wariness against the ethnic Chinese. Moreover, the large amount of international investment that went to China did not go to Southeast Asian countries, thereby, in some sense, curbing their economic development. Until very recently, China invested little in Asia. Chinese aid to Asia also is small, with the exception of aid to North Korea and, until recently, Myanmar. The decisions of the Myanmar government since 2011 to reduce economic engagement with China as it seeks closer integration with western-aligned countries indicates important limits on China’s attractiveness as an international partner. China’s large foreign exchange reserves did not translate into big grants of assistance abroad. In fact, it continues to receive over US$6 billion of foreign assistance annually from the World Bank, the Asian Development Bank, over 20 UN agencies including the UN Development Program, and many developed countries, including under provisions of the Kyoto Protocol on climate change. Presumably, these funds might be allocated to other developing countries, including some in Southeast Asia, had they not gone to China. It remains reluctant to assume significant costs, risks, or commitments in dealing with difficult regional issues. The unwillingness to control Chinese assertiveness and pursue a consistent line of reassurance towards its neighbors and other countries in recent years tarnishes China’s image. In most of Southeast Asia, governments are strong and see their legitimacy and success resting on nation building and economic development, which require a stable and secure international environment. Unfortunately, Asia is not particularly stable, and most governments privately tend not to trust each other. As a result, they look to the United States to provide the security they need. They recognize that the US security role is very expensive and involves great risk, including large-scale casualties if necessary. They also recognize that neither China nor any other Asian power or coalition of powers is able or willing to undertake even a fraction of these risks, costs, and responsibilities. The nation-building priority of most Southeast Asian governments depends importantly on export-oriented growth, much of it to developed countries, notably the United States. The United States has run a massive trade deficit with China, and a total annual trade deficit with Asia valued at over $350 billion. Regional government officials recognize that China, which runs an overall trade surplus, and other trading partners of Asia are unwilling and unable to bear even a fraction of the cost of such large deficits, which are very important for Southeast Asian governments. The Bush administration was generally effective in interaction with Asia’s powers. The Obama government has built on these strengths. “Rebalancing” with regional governments and multilateral organizations has a focus on Southeast Asia and a scope going from India to the Pacific Island states to Korea and Japan. Its emphasis on consultation and inclusion of international stakeholders before coming to policy decisions on issues of importance to the region also has been broadly welcomed. The US Pacific Command and other military commands and security and intelligence organizations have been at the cutting edge of wide-ranging and growing efforts to build and strengthen webs of military and related intelligence and security relationships. The United States has long engaged Southeast Asia through business, religious, educational, media, and other interchanges. Such active non-government interaction puts the United States in a unique position and reinforces its overall influence. During a speech in Manila in December 2013, Secretary of State John Kerry highlighted the millions of dollars of assistance to Philippines storm victims coming from such US business partners as Coca Cola, Proctor and Gamble, Dow Chemical, Fed-Ex, Cargill, and Citibank.11 Meanwhile, almost 50 years of generally color-blind US immigration policy since the end of discriminatory restrictions on Asian immigration in 1965 has resulted in the influx of millions of Southeast Asian migrants who call America home and interact with their countries of origin in ways that undergird and reflect well on the American position in the region. Kerry noted there are now over four million Filipino-Americans and over 350,000 American residents in the Philippines. Part of the reason for the success of US efforts to build webs of security related and other relationships with Southeast Asian countries is active contingency planning by many governments. As power relations change in the region, notably on account of China’s rise, regional governments generally seek to work positively and pragmatically with rising China on the one hand; but, on the other hand, they seek the reassurance of close security, intelligence, and other ties with the United States in case rising China shifts from its avowed benign approach to one of greater assertiveness or dominance. Against the background of recent Chinese assertiveness, regional governments’ interest in closer ties with the United States has meshed well with the Obama government’s engagement initiatives. The US effort to keep stability while fostering economic growth overlaps constructively with the priorities of the vast majority of regional governments as they pursue nation-building. In addition, a survey of leadership debates over foreign policy among Asian-Pacific leaders13 shows movement toward what international relations theory calls realism in the United States, China, Japan, Russia, India, and several middle and smaller powers including Indonesia, Australia, South Korea, Vietnam, Malaysia, and Singapore.14 Such perspectives are important in how these leaders view the changing power dynamics and security issues seen notably in factors 1, 3, and 5. While vigilant regarding changing circumstances that could have an impact on their security, sovereignty, and other important interests, leaders also recognize the importance of economic development, the lynchpin of their political legitimacy. Thus, they endeavor to use the liberal international economic order in ways that benefit them and their countries, and in so doing they subscribe to varying degrees to aspects of liberalism in international relations theory. Southeast Asian leaders also show support for aspects of the theory of constructivism manifest in ongoing efforts to build regional and international organizations and to support international norms as effective means to manage interstate tensions and differences and to promote greater interstate cooperation. Most regional governments also foster a strong identity for their nation as an independent actor in regional and global affairs representing the interests of the peoples of their respective countries. Supporting such an identity often is an important element in their continued political legitimacy.15 Obama’s rebalancing initiatives fit well with most of these regional dynamics. The US strengths look even stronger when compared with China’s recent approaches. The United States has a proven record of bearing the costs and risks of sustaining regional stability that is essential for the development and nation building sought by the regional leaders. There is little perceived danger of offensive US military, economic, or other policy actions amid repeated stress by American leaders against unilateral change in the status quo. By contrast, China’s message of closer economic cooperation conflicts with Chinese threats and coercion toward governments that disagree with China, especially on issues of sovereignty and security. China’s stridency on these matters has grown with the expansion of coercive civilian and military power. Alarmed Asian neighbors probably will continue to seek reassurance in closer relations with the United States, thereby deepening and strengthening the American integration with the region. Chinese leaders focus on a narrow win-set of Chinese interests. They avoid the kinds of costs and risks borne by the United States. Regional leaders watch closely for signs of US military withdrawal or flagging interest, but they find commitments to sustain its robust security presence and close military cooperation with the vast majority of Southeast Asian states. China’s role as a trader, site for investment, and increasing important foreign investor will continue to grow. Unlike the United States, China has a great deal of money that could be used to benefit its neighbors. Governments engage in sometimes protracted talks with Chinese counterparts to find ways to use the money consistent with China’s ubiquitous win-win formula. In general, China will part with its money only if there is assurance it will be paid back and the endeavor will support its narrow win-set. Of course, much China trade is dependent on foreign investment and access to markets in the United States in particular. The United States almost certainly will not quickly reverse the large trade deficit that undergirds the export-oriented economies of the region. Asian leaders are watchful for signs of US protectionism, but they find that steady US economic recovery reinforces support for enhanced free trade initiatives of the Obama government. By contrast, China’s commitment to free trade seems more selective and narrow. It also is prone to go well beyond international norms in retaliating against others over trade and other issues. Its cybertheft of trade and economic information and property is enormous. Its currency manipulation and other neo-mercantilist practices disadvantage neighboring economies along with the United States.16 China also has pursued extraordinary pressure on Japan for the sake of territorial claims, risking enormous negative consequences for regional economic growth. In contrast, the United States has endeavored to calm the tensions and played the role of stabilizer highly valued by most regional governments. The growing US security, economic, and political relationships with the wide range of Asian-Pacific governments under terms of the rebalance has the effect of strengthening them, reinforcing their independence and identity. While many of these governments disagree with US policies in the Middle East and on other issues, American interest in preserving a favorable balance of power in the region is supported by the prevalence of such stronger independent actors. By contrast, China’s assertiveness shows its neighbors that Beijing expects them to accommodate a growing range of Chinese concerns, even to the point of sacrificing territory. Strengthening those that resist China’s pressure is seen in Beijing as a hostile act. Most governments expect Obama to improve relations in the region in ways that do not exacerbate China-US tensions and thereby disrupt the region. Adjustments in the rebalance policy, giving less public emphasis to competition with China and the military dimension, while stressing an extraordinary series of top-level engagement efforts with China serve to manage tensions in line with regional concerns. The Obama government has also advanced markedly US relations with the various regional organizations valued by Asian governments as part of their efforts to create and build institutions to ease interstate rivalries and promote cooperative relations. It seems sincere in pursuing interchange that is respectful of them. China depicts close alignment with these groups, though assertive ambitions regarding disputed territories have seen Chinese leaders grossly manipulate these bodies or resort to coercion and intimidation. The Obama and the previous Bush administrations periodically assessed Southeast Asian and US opinion on the strengths and weaknesses of the United States and rising China in the region. They repeatedly discerned that officials find it hard to deviate from the above noted strengths and limitations of China’s rising influence, of the significant strengths and limitations of the United States, and of the contingency planning of regional governments. China continues to advance but encounters repeated obstacles, some home grown. Up to now, the United States remains the region’s leading power. Debate continues over the US ability to sustain security commitments, open economic practices and diplomatic engagement in Southeast Asia. Obama’s cancelled trip to Southeast Asia feeds the debate, but the Obama government seems determined to stay the course. Moreover, many regional governments are wary of the implications of China’s rise as they seek mutual benefit in greater economic and other interaction with China. Some are taking concrete steps to assist the United States to provide so-called common goods supporting regional stability and prosperity. Asia is the world area where China has exerted the greatest influence, but prevailing conditions do not appear conducive to its emergence in a dominant position in Southeast Asia in the foreseeable future. At bottom, what this situation means for US-China relations is more competition and manoeuvring in Southeast Asia, but without a power shift or, probably, a major Sino-American confrontation. American leaders have no interest in such a confrontation. Even if Chinese leaders harbor ambitions to challenge, erode, and topple US leadership, foreseeable power realities continue to show that serious confrontation is ill advised. 1. David Brunnstrom, “US says China’s fishing curbs ‘provocative and potentially dangerous,’” Reuters, January 9, 2014, http://www.reuters.com/article/2014/01/09/us-usa-china-fishing-idUSBREA0817720140109; Zachary Keck, “US Warns China Against a Southeast Asia ADIZ,” The Diplomat, December 18, 2013, http://thediplomat.com/2013/12/us-warns-china-against-a-south-china-sea-adiz/. 2. Andrew Moody, “Academic warns Obama on Pacific policy,” China Daily, September 30, 2013, http://europe.chinadaily.com.cn/business/2013-09/30/content_17003824.htm; Douglas Paal “Contradictions in China‘s Foreign Policies,” Article, Carnegie Endowment for International Peace, December 13, 2013, http://carnegieendowment.org/2013/12/13/contradictions-in-china-s-foreign-policy/gw4w. 3. “Pivot to the Pacific? The Obama Administration’s ‘Rebalancing’ Toward Asia,” Congressional Research Service, Library of Congress, Report 42448, March 28, 2012; Robert Ross, “The Problem with the Pivot,” Foreign Affairs 91, no. 6 (November/December 2012): 70-82; Philip Saunders, The Rebalance to Asia: US-China Relations and Regional Security (Washington, DC: National Defense University, Institute for National Security Studies, 2012); Robert Sutter, R., Michael E. Brown, and Timothy J. A. Adamson, “The US Rebalance and Asia-Pacific Security,” (Washington, DC: The Sigur Center for Asian Affairs, Elliott School of International Affairs, George Washington University, August 2013). 4. “China-Southeast Asia Relations,” Comparative Connections 15, no. 2 (September 2013), www.csis.org/pacfor. 5. “China-Southeast Asia Relations,” Comparative Connections 15, no. 3 (2014), www.csis.org/pacfor. 6. Joseph Nye, “Understanding 21st Century Power Shifts,” The World Financial Review, http://www.worldfinancialreview.com/?p=1128; Martin Jacques, When China Rules the World: The Rise of the Middle Kingdom and the End of the Western World (New York: Penguin, 2012). 7. On China’s strengths and weaknesses see: David Shambaugh, China Goes Global (Oxford: Oxford University Press, 2013); Andrew Nathan and Andrew Scobell, China’s Search for Security (New York: Columbia University Press, 2012); Denny Roy, Return of the Dragon: Rising China and Regional Security (New York: Columbia University Press, 2013). 8. The People’s Republic of China during the Cold War repeatedly sent security forces across its land borders; trained, financed, and supplied tens of thousands of armed insurgents fighting against right-wing and neutral governments in Southeast Asia; and carried out major military invasions of India and Vietnam and repeated armed attacks against Taiwan. 9. Robert Sutter, “Assessing China’s Rise and US Influence in Asia—Growing Maturity and Balance,” Journal of Contemporary China 19, no. 65 (June 2010), 591-604. 10. Author’s findings based on interviews with over 200 officials from 10 Asia-Pacific countries discussed most recently in Robert Sutter, Foreign Relations of the PRC, (Lanham MD: Rowman and Littlefield, 2013), 321-326. 11. John Kerry, “Remarks at American Chamber of Commerce Business Community Event,” US Department of State, December 17, 2013, http://www.state.gov/secretary/remarks/2013/12/218819.htm. 12. See among others, Robert Sutter The United States in Asia (Lanham, MD: Rowman & Littlefield, 2009), 154; Suisheng Zhao, “Shaping the Regional Context of China’s Rise: how the Obama administration brought back hedge in its engagement with China,” Journal of Contemporary China 21, no. 75 (May 2012): 369-390. 13. Henry Nau and Deepa Ollapally, World Views of Aspiring Powers (Oxford: Oxford University Press, 2012). 14. Author interviews in Foreign Relations of the PRC. 15. Gilbert Rozman, East Asian National Identities: Common Roots and Chinese Exceptionalism (Washington, DC and Stanford, CA: Woodrow Wilson Center Press and Stanford University Press, 2012). 16. Wayne Morrison, “China-US Trade Issues,” Congressional Research Service Report RL33536, December 16, 2013. Robert Sutter has provided an impressive overview of the US-China competition for influence in Southeast Asia. No surprise—his analysis is balanced, insightful, and substantively rich. He is particularly effective in his portrayal of China’s nationalistic ambitions, its preoccupation with a narrative of victimization at the hands of outside powers, and its willful blindness to the interests and views of its Southeast Asian neighbors when it comes to territorial claims in the South China Sea. His conclusions are broadly optimistic on two counts: (1) the congruence of US and Southeast Asian national interests and the reassertion of those interests in the region (the "pivot") will effectively preserve US strategic preeminence and (2) the understanding on all sides of the downside risks will prevent the outbreak of conflict and preserve regional peace. This observer's reservations derive from greater pessimism on both counts. First, China's strategic approach to Southeast Asia rests on the attraction of growing economic ties—and outright intimidation. Beijing's breakneck investment in maritime military capabilities has generated deep-seated fears in the region. It remains to be seen whether the US pivot/rebalance will be given sufficient muscle and tactical acumen to keep those fears contained. Southeast Asian governments want American support, but they fear Chinese hostility—and China is a permanent presence. Southeast Asian leaders need iron-clad confidence that the United States will be an effective bulwark for the long haul—and on that score the jury is still out. Second, China's willingness to use coercive military actions to expand its territorial reach has bordered on the reckless with no diminution in sight. Southeast Asian governments (notably the Philippines and Vietnam, but also Malaysia and Indonesia) have taken steps to shore up their own defensive positions in the disputed maritime domain. We have already seen several confrontations between Chinese maritime enforcement vessels and US naval patrols. There is a high likelihood that China will declare an ADIZ over the South China Sea as it did recently in the East China Sea. In sum, the potential for a maritime confrontation that escalates (perhaps inadvertently) into an armed clash and a loss of life is quite real. In such an event, all bets are off.